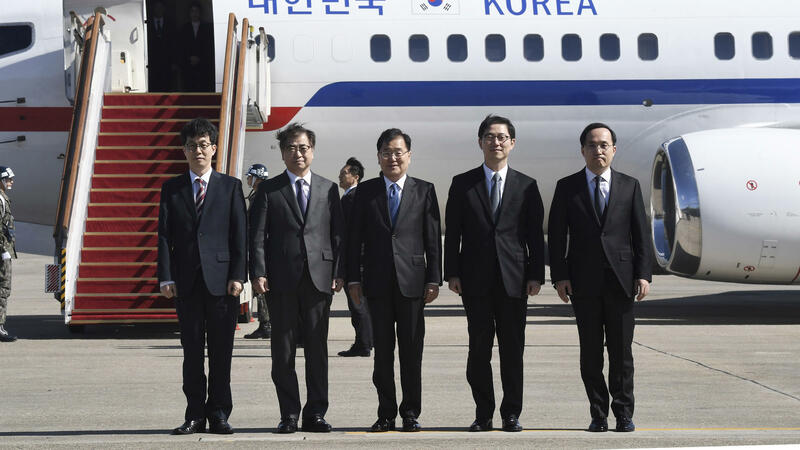 South Korea's national security director Chung Eui-yong, center, National Intelligence Service Chief Suh Hoon, second left, and others in the delegation pose before boarding an aircraft as they leave for Pyongyang at a military airport south of Seoul Monday. Updated at 11:10 a.m. ET. North Korean leader Kim Jong Un hosted a dinner to welcome delegates from South Korea on Monday, in a visit Seoul hopes will pave the way for talks between North Korea and the United States. The 10-member delegation includes a top national security adviser and spy chief — marking the first time South Korean officials are reported to have met the North Korean leader since he took power in 2011. The trip is a reciprocation for the visit that North Korean officials, including the leader's younger sister Kim Yo Jong, made to the Winter Olympics last month. The South Korean envoys flew a direct route from Seoul to Pyongyang by government plane. They'll stay for two days. The last South Korean delegation to go to North Korea was more than 10 years ago, in 2007, which helped create conditions for an inter-Korean summit later that year. Following this week's visit, two of the envoys — the head of the National Security Office in South Korea and the intelligence chief — are expected to go to the United States to brief government officials. South Korean media say there will likely be a briefing for H.R. McMaster, President Trump's national security adviser. While the envoys aim to discuss conditions for U.S.-North Korea dialogue, the Trump administration has said it doesn't want to have formal talks unless North Korea is willing to discuss giving up its nuclear weapons. "Now we are talking and [North Korea], by the way, called up a couple of days ago. They said that 'we would like to talk.' And I said, 'So would we, but you have to denuke, you have to denuke,'" President Trump told attendees at the annual Gridiron Club dinner over the weekend. Meanwhile, North Korea has said it wants to go to the table with the United States as equals, which means Pyongyang refuses to put up its nuclear weapons as a precondition to talks. Where does that leave things? It's possible that the U.S. could soften its stance and say that North Korea agreeing to a moratorium, or freeze, in developing its weapons program would be enough to start a dialogue. But if there isn't progress toward dialogue between the U.S. and North Korea, negotiations between the North's Kim and South Korean President Moon Jae-in remain possible. Last month, Kim Yo Jong went to Seoul and extended her brother's invitation to Moon to come for a summit in Pyongyang. Moon practically agreed to go, but said the conditions for that meeting to occur have to be detailed first. One of Moon's conditions is that North Korea make a more concerted effort to have dialogue with the United States. It all points to progress in avoiding confrontation between the U.S. and North Korea, but time is tight. Seoul and Washington are expected to restart their postponed annual military exercises in early April. North Korea despises these drills. It sees them as a rehearsal for invasion. That means diplomats have about a monthlong window to get the two sides either to the table or on a path to it before the exercises — and the typical backlash from North Korea about the drills — start again in earnest. Se Eun Gong contributed to this post. South Korea, like the United States, has an intelligence chief. South Korea also has a head of a national security council. It is safe to say that for those two South Koreans, job No. 1 is to get inside the head of North Korean leader Kim Jong Un, their neighbor who periodically threatens them with war and who, under normal circumstances, they would never, ever, ever get to meet. Today, they're meeting him. They're part of a South Korean delegation making a trip to Pyongyang. NPR's Elise Hu covers the Koreas for us, joins us now from Seoul. ELISE HU, BYLINE: Hi there. INSKEEP: Is this as big a deal as it seems? HU: It is. This is believed to be the first time Kim Jong Un has spoken face to face with South Korean officials since he took power in 2011. And it's part of this diplomatic offensive that he's been on since January 1. It's all happened rather quickly and quite a departure from last year when all we saw was a string of weapons tests and rhetoric from both North Korean state media and Kim himself and U.S. President Donald Trump. So a lot has happened diplomatically here on the Korean Peninsula just within the last couple of months. INSKEEP: Well, what is the purpose of the trip? HU: ...Last month. And the envoy essentially are hoping to discuss preconditions for not only an inter-Korean summit between Moon and Kim Jong Un possibly, but also preconditions for a potential U.S.-North Korea dialogue to take place. INSKEEP: OK, preconditions - that just means agreeing on what the terms of debate would be, what they would be talking about. What preconditions has the United States set for talking with North Korea? HU: Well, we've talked about this a few times now. And the Trump administration has said it doesn't want to have any formal dialogue unless North Korea is willing to talk about giving up its nuclear weapons. President Trump spoke at a Washington dinner this weekend and said, "North Korea, by the way, called up a couple of days ago," which we don't know, you know, if that's the case - but he said, "North Korea called up a couple of days ago and said, we would like to talk. And I said, so would we, but you have to denuke, you have to denuke." That's the direct quote from President Trump but not a detailed policy statement. That does however - right. INSKEEP: Yeah, we should be clear this was at the Gridiron Dinner, so the president is telling jokes. He goes on to say, I would not rule out direct talks with Kim Jong Un. As far as the risk of dealing with a madman is concerned, that's his problem, not mine - president of the United States. HU: So - right. Right now, we're not clear whether he was joking or whether this is a policy statement. But clearly, the position of the United States has been that they don't want to meet or that the country doesn't want to meet with North Korea without denuclearization being on the table. INSKEEP: Well, where does that leave things if North Korea is not willing to put its nuclear program on the table at all? HU: Right. That's right. North Korea has said it wants to go to the table as equals. 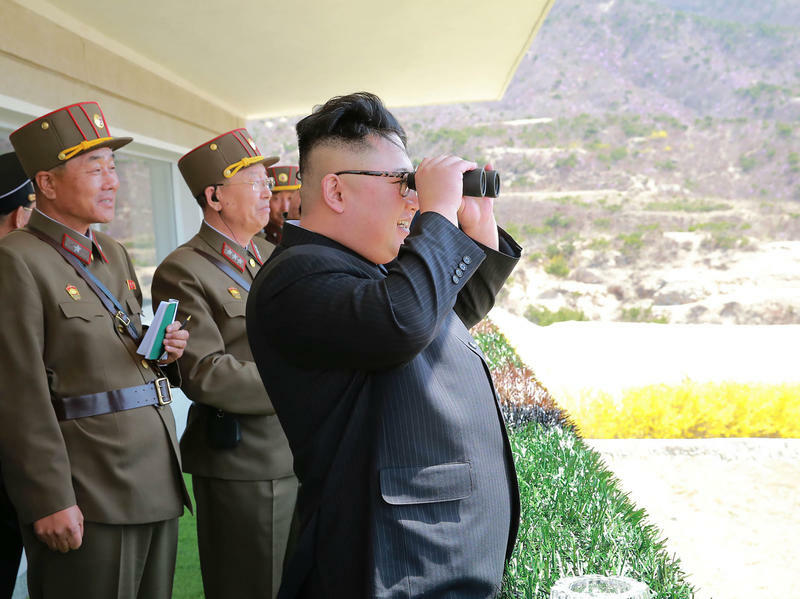 And there is possibly wiggle room if the U.S. maybe softens its stance and says that North Korea maybe agreeing to freeze - to a freeze or a moratorium in developing its program, that might be enough to start a dialogue. But this is all unclear right now, Steve. INSKEEP: If it's not too likely soon that North Korea's president will be talking with President Trump or that North Korea would be talking directly with Americans, could North Korea's president be talking with South Korea's president anytime soon? HU: It could. President Moon practically agreed to go to Pyongyang after Kim Jong Un's sister delivered the invite when she came here to South Korea for the Olympics. But President Moon said the conditions for that meeting still have to be set first. And one of the South Korean president's conditions was that North Korea make a more concerted effort to have dialogue with the U.S. And it's clear that that seems to be happening now with the summit between Kim Jong Un and the South Korean envoys in Pyongyang. INSKEEP: Do all of these talks make things feel less tense? HU: They do. You know, Seoul and Washington are expected to start military exercises, though, in early April, so there's not a whole lot of time for this cooldown to turn into something more promising diplomatically. So we'll - we will see. INSKEEP: NPR's Elise Hu, thanks very much. INSKEEP: She's in Seoul. Transcript provided by NPR, Copyright NPR. Efforts to make a show of North Korean and South Korean unity at the next Olympics are drawing a backlash in South Korea. 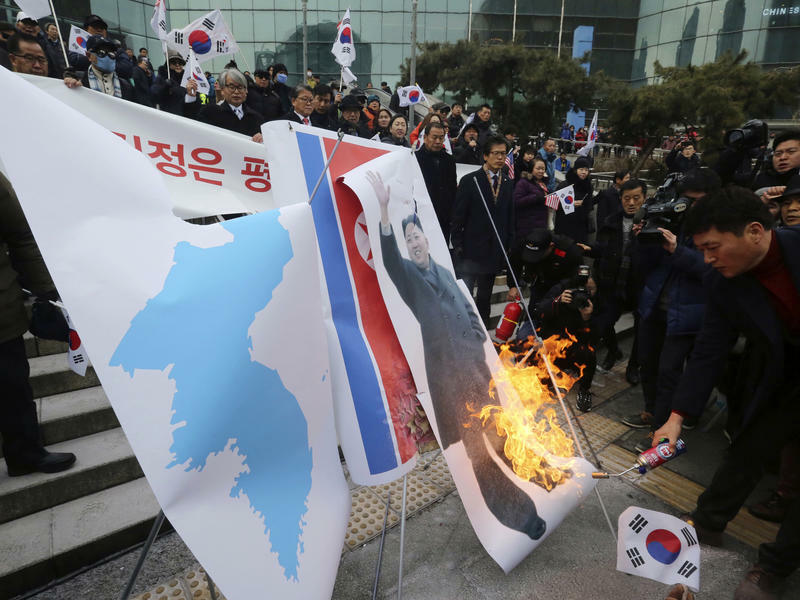 In Seoul, protesters Monday set fire to the North Korean flag and a photo of Kim Jong Un. The South Korean president's approval rating has dropped in recent days as well. "We oppose, we oppose, we oppose," shouted demonstrators at Seoul Station, the rail and subway station in the center of the capital. They showed up to confront a North Korean advance team that had arrived to scout out Olympic venues. North and South Korea have just held their first high-level meeting in two years to discuss the North's participation in the upcoming Pyeongchang Winter Olympics. These talks follow months of tension and escalating rhetoric over the North's continued nuclear and ballistic missile tests. Since his inauguration in May, South Korean President Moon Jae-in has sought to engage with the North, and when Kim Jong Un finally opened the door to negotiations last week, the South eagerly agreed.